When you make a donation to Boys & Girls Clubs of Metro Denver, you can reduce your taxes through the Colorado Child Care Contribution Credit. 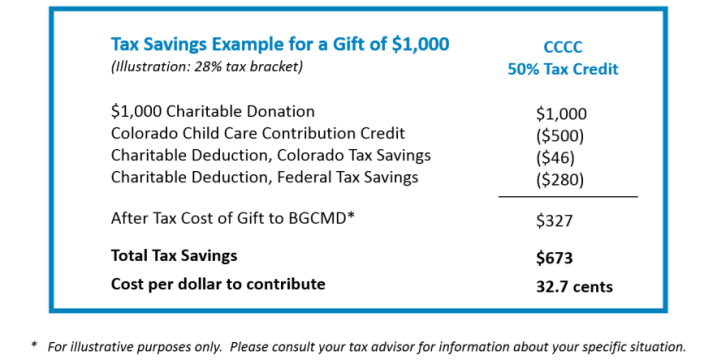 Cash donations to Boys & Girls Clubs qualify for the Colorado Child Care Contribution Credit, which decreases the after-tax cost of gifts by more than 50%. Half of your donation will be offset by a dollar-for-dollar credit against your Colorado income taxes. You will still be able to claim your full contribution as a charitable deduction on your federal and state income tax returns if you itemize deductions. Upon request, Boys & Girls Clubs of Metro Denver will provide a signed letter that states the amount of the cash gift, along with the DR1317 tax form certifying the child care contribution.